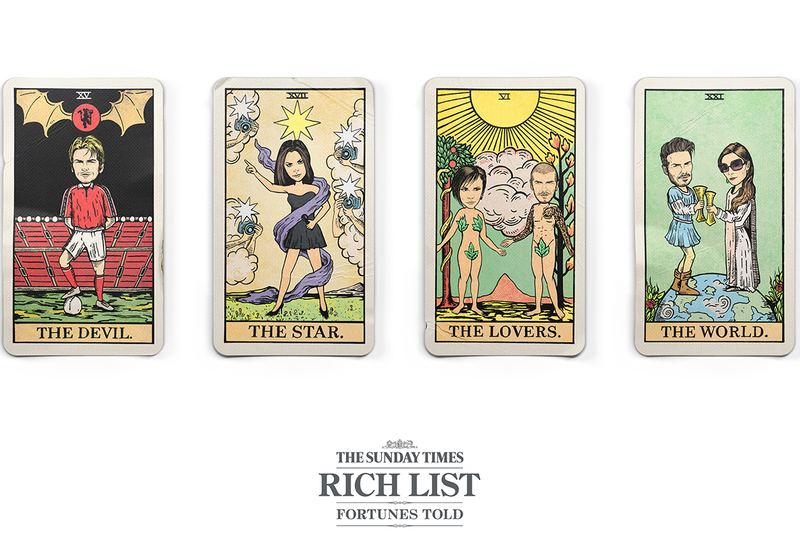 Adele, the Beckhams and Simon Cowell are depicted as symbols from tarot cards in this year's campaign for the Sunday Times' annual "Rich List," the newspaper's list of the U.K.'s wealthiest people, which takes inspiration from 19th century fortune-telling. The print and poster campaign, by CHI & Partners, depicts including Adele as "The Empress," Cowell as "Judgement," and J. K. Rowling appears as "The Queen of Wands." Meanwhile the Beckhams appear as "The Devil," "The Star," "The Lovers" and "The World," symbolising how they have increased their fame and fortune both as a couple and as individuals. 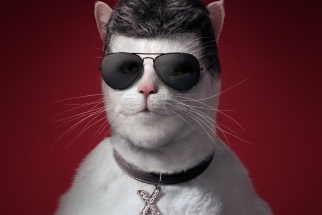 In the past few years, campaigns for the Sunday Times Rich List have portrayed celebrities as "Fat Cats" and yoyos. These were by Grey London, but The Sunday Times' owner, News U.K., consolidated its advertising into The& Parntership last year. Prior to 2012, CHI & Partners had created the ads.